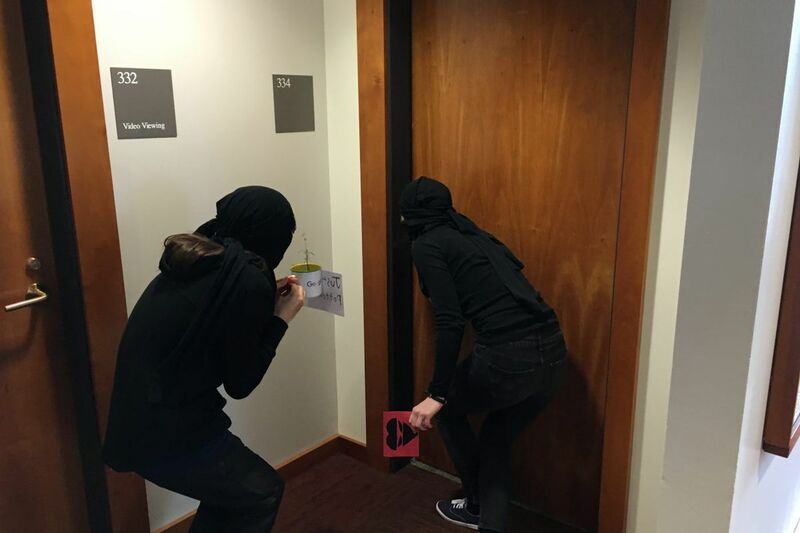 Ninja Valentine deliverers close in on a classroom at Swarthmore College. Who are those stealthily clad Ninjas creeping around one of the nation's most prestigious college campuses? Swarthmore College students, that's who. Their mission? Deliver Valentine's cards, affectionately known as Ninja Grams, sent by Swarthmore students and staff to students and staff. Their work comes with a price. Order just a card, it's $3. Want to add a truffle? Add a dollar. Oh, and if you'd like your Ninja deliverers to faux fight, that will be another $3. "There's also a discount for bulk," said Julia Morriss, 20, a chemistry and biology major, who was manning the "Ninja Central" desk on the 1,620-student campus in Delaware County last week. It's all for a good cause. This year, proceeds will be donated to Engineers Without Borders, which aids developing countries. Ninja-grams have been delivered at least since 2010 when more than $1,000 was raised for Haiti Community Support after a devastating earthquake. Among other efforts supported in past years were Animal Coalition of Delaware County and Hurricane Katrina Relief. Morris and her sidekick — who would identify herself only by the sign she carried, "Just a Potted Plant" — were among the Ninja deliverers sneaking around the campus on Friday in their black garb and balaclavas, toting colorful swords. They hand-carried red cards with a Ninja heart inked in black, burst into classrooms where heady subjects were being debated and delivered the goods to unsuspecting recipients. Anonymous Ninja deliverer, “Just a Potted Plant.” awaits her next assignment at Ninja Central. Sometimes they would prance and leap upon a fixture before laying down the card. "We're stealthy," explained Morriss, who is from Hastings-on-Hudson, N.Y. "Most people think it's pretty fun. Most professors are pretty good about having us in there. We try not to be too disruptive, in and out in two minutes or less." A white board at Ninja Central noted classrooms where deliveries were not welcomed – Bio 2, French 14, Physics 4, and Econ 21 — largely because quizzes were scheduled, Morriss said. Academics still trump sweet nothings on a campus where only 10 percent of applicants are admitted. Ninjas present a card in an Arabic class. Ziv Stern, 20, a sophomore linguistics major from the Bronx, who was helping at Ninja Central, said students send the cards to friends or someone they want to embarrass a little bit. "I sent one to my roommate. She sent one to me," Morriss said. In a class on Arabic, recipient Coleman Powell, 20, a sophomore from Lowell, KY., smiled. "It's very heartfelt," Powell said. In another class, the female recipient looked less than pleased. "Some people think we're kind of annoying," Morriss acknowledged. Deliveries concluded on Friday; no more Ninjas on campus until next year.